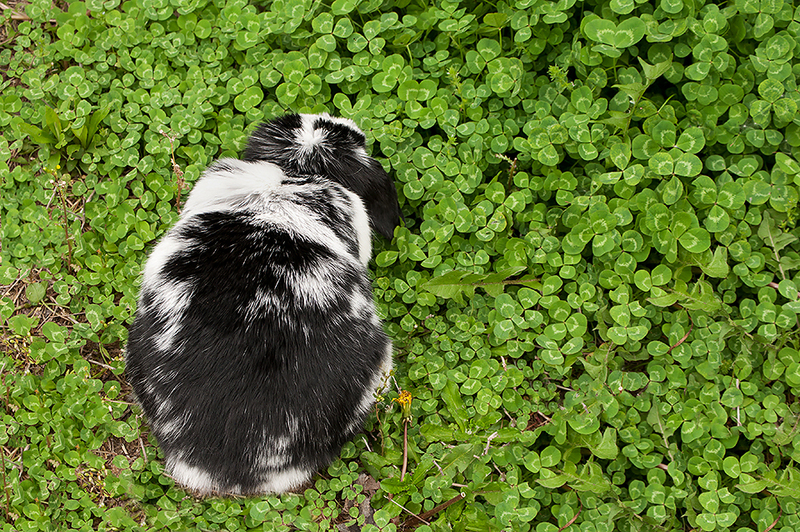 It’s spring time and we finally have the opportunity again to collect fresh greens for our rabbits – not just from the grocery store, but directly from outside. There are many reasons why it’s a good idea to find fresh and maybe even wild greens for our bunnies. First of all, rabbits love fresh greens and are generally really excited to be presented with a recently picked selection. Even the best grocery store can’t compete with such freshness (plus, it’s free). Also, wild plants are often more nutritious, because they weren’t optimized for taste by and for humans over many years, and feeding wild plants makes for a more natural diet. And while grocery stores only have a limited selection of produce, there are many more plants our bunnies would love and benefit from outside. If your rabbit isn’t used to eating fresh grass or any other plant you wish to collect, make sure you introduce the new food slowly and one at a time. This has to happen all over again every spring for most rabbits! Once introduced (this may take a few weeks), you can feed unlimited amounts of grass and a good selection of other greens. “Introduced” means your rabbit tolerates the food well and has had no diarrhea or other digestive issues. Please avoid placing your rabbit outside and letting it eat all it wants without introducing the new food first. Mr. Bunny had small amounts of grass every day for a couple of weeks before we let him eats from the “all you can eat buffet”, also known as our backyard. Choose plants as far away from streets and vehicles as possible. Try to go to an area that dogs and cats don’t frequent. Thoroughly wash the herbs and flowers. Don’t offer anything you can’t identify. Or anything you are not sure is safe. Try to collect more than one kind of plant for variety. Avoid commercial fields (you never know what kind of fertilizer they use) and the ones with grazing cows/sheep/horses . Never feed mowed grass. It’s really dangerous for rabbits, because mowed grass starts to ferment much faster and could cause serious issues and death. Also, lawn mower blades have small amounts of oil on them, which comes in contact with the grass and would be harmful if swallowed. Spread fresh greens out on a paper towel for a bit before feeding. That way everything can dry and any insects you may have accidentally brought in can flee and be picked up. Grass, Lawn, Meadow – What’s the difference? We often use these three words interchangeably, but there is a significant difference (for our rabbits at least). Grass is the main term for many different plants that grow all over the world. A select handful are grown as feed for animals such as rabbits, horses, cows, guinea pigs, and more. Here in the US we mostly use timothy grass for our small pets and generally convert it to hay and pellets, but there are many other kinds of grass that could be used. 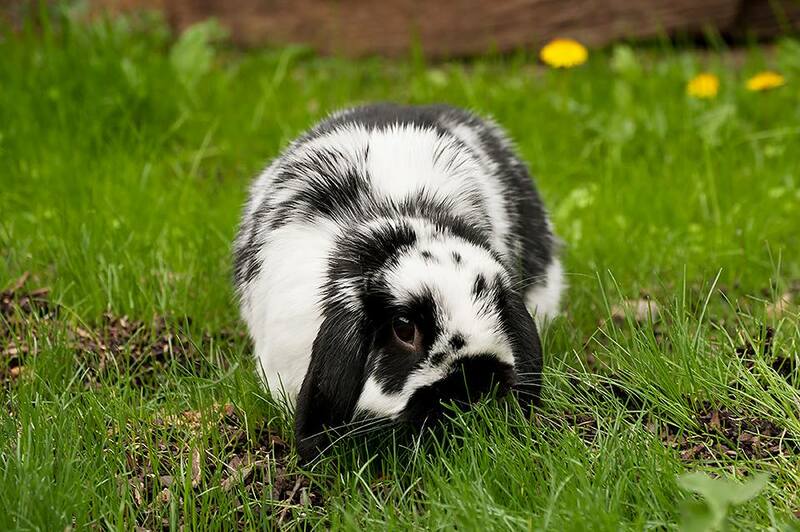 A lawn is the least desirable type of grass for rabbits to eat, because it generally consists of only one kind of grass that was chosen to be decorative, not nutritional. Most of the time, all the “interesting” plants, such as dandelions, are carefully removed. Unless it has been treated with pesticides, rabbits can certainly graze on a lawn, but it doesn’t provide a whole lot of nutritional value. A meadow is an area full of different kinds of grass, flowers, and herbs. It provides rabbits with the most natural diet and is the preferred fresh food source. 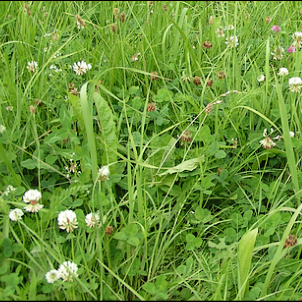 We can find meadows in the wild or you can create one at home in your backyard to replace the lawn (or part of the lawn). Your neighbors might not be too thrilled with the “messy” area, but your rabbit will be ecstatic! We are actually growing a meadow right now. There are probably 10 different kinds of grass seeds spread out (including timothy), waiting to grow, as well as dandelion, mint, parsley, basil, clover, cornflower, chamomile, and more. Any kind of home grown produce, whether it’s from a yard or a pot on the balcony, will be a welcome treat for your bun! Bunny, for example, hates mint from the grocery store, but the ones grown in our yard is a favorite. Grass that rabbits enjoy to eat include timothy, orchard grass, meadow fescue, tall fescue, crested dog’s-tail, Kentucky bluegrass, chewing’s fescue, Italian ryegrass, English ryegrass, and more. Great herbs and flowers you can find outside include dandelion, marigold, clover, ribwort, common chickweed, fireweed, and more. Unfortunately, we couldn’t find a good field guide in English that identifies wild plants and tells us about them in relation to small animals, but Angier’s Field Guide to Edible Wild Plants might be a good start. Please note that plants that are fine for humans to eat are not automatically good for rabbits also.